Honolulu is literally loaded with eateries, restaurants and dining venues, especially in the downtown area of Bishop Square, with its blend of easy going walk-in cafés and upscale venues, while Honolulu's other downtown area of Chinatown is simply awash with places to eat at any time of the day or night. Another hotspot for the hungry tourist in Honolulu is the aptly named Restaurant Row on the corner of Punchbowl Street and Ala Moana Boulevard near downtown, while the Ala Moana and Aloha Tower Marketplace shopping centers have scores of restaurants and cafés in all categories. In addition to the numerous and varied dining locales and restaurants in Honolulu, you will be pleased to find not only delicious Hawaiian regional tastes, but also several other cuisines including Chinese and Japanese, French and German, as well as Vietnamese, Thai and Laotian venues. Hawaiian fare is a delightful blend of regional cuisines with dishes generally consisting of seafood, vegetables, herbs and fruit. Opening times vary depending on the area and type of establishment, although lunch dining venues and eateries generally open at around 11:00 and close again at 14:00 to prepare for evening diners. They reopen anytime between 16:00 and 17:30 and may close at 21:00 in the week and as late as 22:00 or 23:00 on weekends, with restaurant bars sometimes staying open until 01:00 or 02:00. 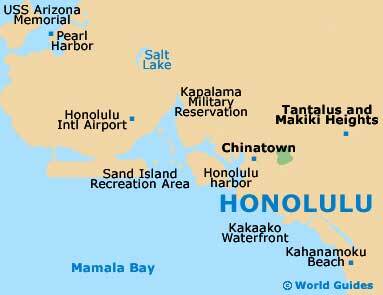 Breakfast can be eaten bright and early in Honolulu in the numerous diners, some of which stay open 24 hours. Restaurant Row on Ala Moana Boulevard and the Ala Moana Shopping Center are two good areas where you will find some quality restaurants in Honolulu with an emphasis on wines and beers. 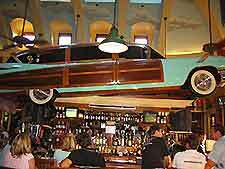 Many of the wine bars and wine orientated restaurants in downtown Honolulu focus mainly on American, Australian and French wines and have numerous selections where the pairing of wine and food is taken seriously. Some of these Honolulu restaurants also have monthly wine and food taste evenings, where patrons get the chance to sample the restaurants' finest products. If you are out of luck at your hotel or fancy a change of venue for breakfast, Honolulu has much to offer, from pancake houses and coffee shops to the usual fast food joints serving breakfasts. Bishop Square is traditionally the area where businessmen dine for lunch, although there are also a number of walk-in cafés and all-American diners that open for breakfast. 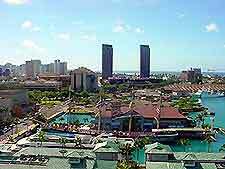 Lunch in Honolulu can be as casual or as formal as you like, with cafés and restaurants in every category located in the hugely popular shopping centers of Ala Moana and the Aloha Tower Marketplace; while more business orientated lunch eateries are tucked away in Bishop Square. Those into Japanese seafood and sushi should head to the bottom end of Ala Moana Boulevard in Waikiki, where there is a string of Japanese buffet restaurants, while Chinatown is known in Honolulu for its Chinese and Thai noodle restaurants. Look out for the snack wagons dotted around the tourist areas - these serve inexpensive plate lunches consisting of a fried meat entree, salad and rice. 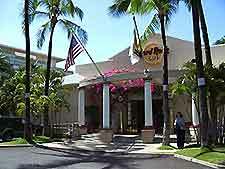 All the major shopping centers in Honolulu have quality restaurants open for evening dining, but it is recommended that you spend at least one evening at one of the many eateries or upscale hotels lining Waikiki Beach and strung along Kalakaua Avenue, where the ambiance is a combination of irresistible sea views and delicious seafood fare. Cocktail cruises are also a popular evening dining experience in Honolulu, as are traditional venues featuring luau evenings and hula dancing. Back in downtown Honolulu, the restaurants and dining areas to head for are the Waterfront Plaza, Restaurant Row along Ala Moano Boulevard and the Ward Center.